May. 4, 2013 1:00 p.m. The race is on! 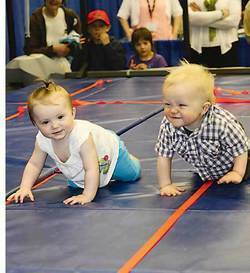 Hudson (on the right) gets his game face on as he "streaks" past little Molly in the Baby Crawl at the Leduc Chamber Expo. This event was a huge hit with the audience, providing a ton of funny moments with babies doing things babies just naturally do.